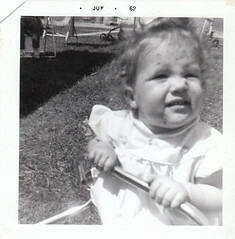 Me enjoying a lovely case of chicken pox. Ah, those were the days. Like childhood wasn't hard ENOUGH when I was growing up, parents keep doing awful stuff to mess up childhood. If I were a child today, I would walk around with dried peas in my shoes like a pilgrim to distract myself from the horror of modern childhood. The evidence? Edited to add: Ok, I had to go back and edit because Mir thought I was being mean and judgy. She may be right. But I aim to please. Especially to please Mir, because she has nice hair. 1. Child-sized crocs. Step away from the Crocs display. Ugly shoes can wait for adulthood. 2. Daycare. Look, I don't like people now. When I was 3, I liked them even less because they seemed larger and scarier. I only attribute the slim grasp I hold on sanity now to the fact that, due to our tiny school size, there was no kindergarten. I got to spend one more blessed year at home in peace with my mom, instead of suffering the slings and arrows of outrageous schooling. (I understand that you may HAVE to put your kids in daycare. I'm just forever thankful that my parents didn't because I know it would have been awful for me as a hyper-sensitive, quiet, misanthropic loner child. On the other hand, it might have made me a nicer and more patient person... Naaaaah. 3. Ruining Halloween. When I was a child, October meant two things: fun costumes and LOTS OF CANDY. Now people are insisting that Halloween be scaled back to an emasculated "Harvest Festivals" because of the witchy/pagan connection. Gah. Halloween is thrilling and a little scary and fun and involves LOTS OF CANDY. Candy is the true currency of childhood, and you people who want a healthy, sane Halloween are ROBBING children. Not having Halloween is like purse-snatching. Do you want to be a common street criminal? Hm? Then hand over the mini-Snickers. 4. Activities. Soccer. T-ball. Dance lessons. More soccer. Music lessons. Swim team. Holy cats. Can't a kid get some time to watch cartoons and pick his nose? How are children these days supposed to indulge their natural tendencies toward sloth and time-wasting? Activities remind me too much of work. You have to show up, be on time, be dressed appropriately, pay attention. What ever happened to sitting on the couch in PJs before your parents got up, eating raw pop-tarts and drinking chocolate milk, watching "I Love Lucy reruns" and trimming your doll's hair with nail scissors? True, nobody ever gave me a trophy for that, but it made me who I am today. Ok, forget that last bit. 6. Birthday party gift bags. When I was a child and you had a birthday party, YOU got the presents. What kid wants to see other people happy on their birthday when by all rights it should be a Roman carnival of indudgence dedicated solely to THEM? Nobody, that's who. Guests BRING presents. Guests don't GET presents. 7. Food allergies. You aren't a kid today unless your parents are freaking out about something you can't eat. The days of Tang and Twinkies for lunch are gone forever, I suppose. 8. Drugs. OK, Mir. I took this one off because, you're right it was kind of judgy and mean and the whole subject is just a minefield of touchy emotions and despair. 9. AP classes. I went to high school back in the 1970s. Teachers were happy if you just showed up and weren't zorked out of your mind on drugs. If you turned in work, any kind of work, that was good for at least a B. Now high schoolers are expected to know stuff and to achieve and to strive for things. All this actual learning and doing most certainly cuts into their time that would be better spent hanging out by the lockers and making fun of other people's outfits, as we so enjoyed doing. Kids today just don't know what they are missing. 10. Ok, Mir, forgive me. I was trying to be funny and I was a little mean. I just want the kids to be happy, really. Start by sparing them from ugly footwear and Miley Cyrus, and we can work from there. The free Picnik online photo editing software I got at BlogHer has led to the recent spate of rotating blog headers. I started playing with the program and just could not stop. FUN! This week's header is in homage to Michael Jordan, the greatest basketball player ever. (I KNOW Magic and Kareem and LeBron are great. But nobody, nobody, will ever top Jordan). When I went to name my blog, http://redstapler.blogspot.com was taken by someone who put up one lousy post and never came back, so I needed to add a lucky number to my URL. I chose 23, Jordan's jersey number, because Michael could fly and because he was magic. If you can watch old video of Michael playing for the Bulls and NOT get a thrill, I think there is something sad and cold and dead inside you. If I ever stop enjoying watching those games, you can whack me in the back of the head with a blunt object and leave me in a ditch, because life won't be worth living anymore. (I always like to say "mutli" instead of "multi." It makes me laugh. I wrote a post over at Snackish, my food blog. Maybe there's a good reason I haven't posted over there for more than a year. The gangaroos and I traveled to the mystic village of Ojai for Ojai Day yesterday. Not "Ojai Days" as most places might have. Good gosh, no. 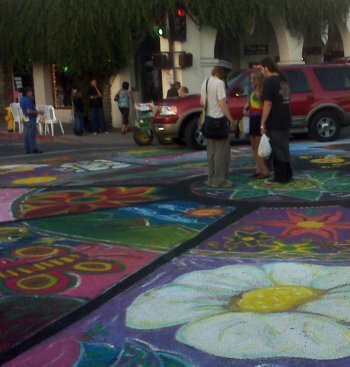 Two days would be such a hassle and Ojai is a very, very laid back kind of place. In Ojai (pronounced O-hi), you can get your chakras balanced, your aura cleansed, and your Feng Shui'd. You need an organic, gluten-free, vegan muffin at the coffee shop? No problem! It is a pleasant little town that is wedged in a deep valley, where giant gnarled oak trees shade the streets and where orange groves scent the warm night air. It served as the backdrop for the movie "Shangri La" and is home to many major and minor celebrities, so one is always squinting at tall guys with good hair thinking "Is that Ted Danson? Yes? No?" A few weeks ago, we took my friend Jim to Farmer's Market there. He is from klassy, klassy Orange County, land of giant blonde hair and Cadillac Escalades in Shimmering Pearl with $3000 rims. Going to Farmer's Market on Sunday morning in Ojai is a great way to get a full blast of the local culture. There was a dreadlocked guy with no shirt, no shoes and a macrame headband with natural crystals woven into it. He smelled of patchouli (of course) and had a tiny cute daughter, who wore moccasins that he had made by hand. There was a girl with bushy, bushy underarms, assuring the Spinach Lady "I evision an abundant crop of leafy spinach for you this year" as she made big, swooping, growing gestures with her hands. We tried vegan fig ice cream (delish) and homemade organic aloe-based personal lubricant (didn't try that). That's just the kind of place Ojai is. The kind of town where, if you feel the need to get away from the lube-industial-complex, you might just find your neighbor squeezing their aloe vera and bottling some homemade personal lubricant in their kitchen. Ojai Day did not disappoint. First, something truly fabulous happened to me. I went to the smelly Starr Market (ask anyone in Ojai about the Starr Market and they will say the same thing: "It's smelly." It is also fully carpeted, which is an odd thing in a grocery store, isn't it?) to buy something small and to get money back from the transaction, since I was not about to give those bastards at B of A $2 for an ATM transaction. Oh joy of my heart! The Holy Grail! 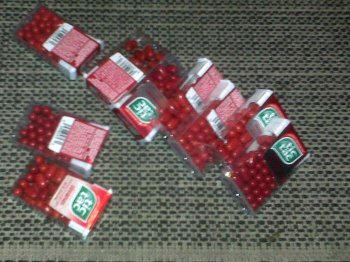 RED tic-tacs. The cashier and the bag boy were laughing at my unrestrained happiness. They acted like red tic tacs are an everyday event in Ojai. I bought ten packages - the most I felt it was seemly to make off with at one time - and I even gave one to CC, because that is the kind of super excellent friend I am - the kind that gives up The Most Valuable Thing in All The World. 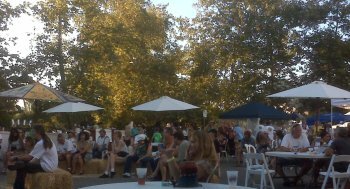 After some vegetarian bratwurst (me) and rattlesnake and rabbit bratwurst (CC and Ish) we went down to the beer garden to sit in the evening shade under the sycamores. It really is a beautiful place. We sat on plastic chairs and listened to some Irish music and predicted who was finally going to be the first person to dance (it was no one, BTW. It's HARD to get white people to dance. Besides, the music all sounded like "When the Devil Went Down to Georgia"). 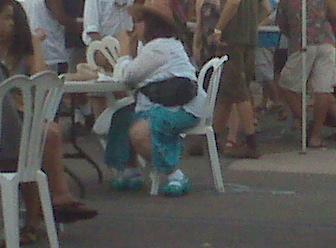 We made fun of this lady's croc-like shoes. Turquoise crocs with thick soles and white socks? Say it isn't so. Then the Naked Chick showed up. What, your town doesn't have a Naked Chick? Ojai does. She has a splendid suntan and a bicycle, and she rides around naked all the time. There is nothing that adds to the festive atmosphere of a beer garden like a cute naked woman wandering around! Everyone took it in good spirits. Guys peeked from around the corner of the beer trailer and laughed with their buddies. Five teenagers lined up to take their photo with their arms around each other's shoulders like she was a rockstar. On the way home, Jerry, who was a few beers to the wind, said "But that's not right! What about the kids? How are you gonna explain naked to the kids?"